All the themes from all of Beethoven’s symphonies, played live by an orchestra, concentrated into one hour and supplemented with electronics – that’s “Nine in One”. Or: a wild rollercoaster ride through the twists and turns of Ludwig van Beethoven’s brain. In the front carriage: Wolfgang Mitterer. He has a reputation, as a musician many’s the time he’s tormented the big concert organs of the continent, as well as composing for important orchestras, ensembles and opera houses, rocking it in jazz clubs or writing film music in his studio in Vienna. Off we go! Radial acceleration. Centrifugal force. Looping. The whole programme. And then what makes riding the rollercoaster so much fun suddenly happens: we can’t feel our own mass anymore, and we experience a moment of weight- lessness. A similar condition may also appear after listening to this album. But what’s certain is that from this point onwards, you hear the ‘New Testament of Music’, as Beethoven’s symphonies are also known, in a completely new way. 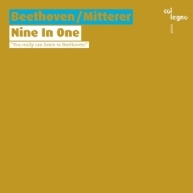 Two people – two men, let’s say, sitting together in Café Jelinek – are chatting about Wolfgang Mitterer’s “Nine In One”. One of them is ‘younger’, the other ‘older’. What younger or older are supposed to mean is up to the reader to decide. At any rate, one of them, the older one, let’s call him Hans, has already listened to this CD. The other one hasn’t. They are both, however, familiar with Ludwig van Beethoven, to a greater or lesser extent. Wolfgang Mitterer studied organ, composition and electroacoustics in Vienna and Stockholm. He is not only one of the Austrian specialists for electronics as well as being equally brilliant on the keyboard and on the slide controls, but is also one of the most innovative composers. His work oscillates between composition and open form. Apart from music for organ and orchestra, a piano concerto and an opera he has produced electronic pieces, conceptualized sound installations, and engaged in collective improvisation with diverse groups, developing a language of extremes, tension and complexity. The pleasure he takes in experimenting leads him to combine contrasting elements in the creation of unpredictable musical events. In one major composition, for instance, he juxtaposes musical bands and children’s choirs with specialized instrumentalists and singers, while filling the hall with surround sound created by live electronics. But his work transcends the merely spectacular, precisely because of his musical presence and the high – deeply moving – intensity and complexity of his compositions. Listening intensely to low sounds has its place just as much as the ‘installing’ of exploding sound fragments in the listeners’ minds. 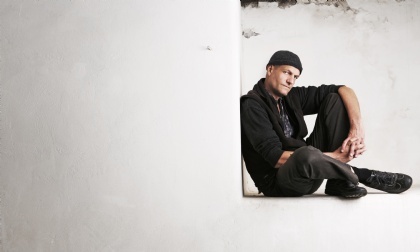 Far from being smoothly pleasurable, Mitterer’s music is still uncannily beautiful at times. 2018 is an exceptional exciting year in the career of Wolfgang Mitterer: In addition to the release of his latest album »Nine In One« he is award winner of the Österreichischer Filmpreis 2018 in the category ’Best Music’ on occasion of his compostion for the documentary »Untitled« (2017, directed by Michael Glawogger (†). Furthermore he composes and conducts the music of the revivial of »Jedermann« at the Salzburger Festspiele 2018. We can talk to each other like that. We’ve known each other for a long time. And we both come from East Tyrol, a remote district in southern Austria. In 1994 I was able to persuade him to compose a “Woodland music for a Venetian saw mill” for the Innervillgraten valley head. At the time, workmen from the rural valley were restoring a water-powered saw – which also represented an impressive percussion instrument, so we thought. At the premiere, it poured with rain, and there was thunder and lightning, causing not just the audience of several hundred to fear for their lives under their umbrellas, but the sound technicians to fear for their equipment. Everyone hung on until the last note. Mitterer’s soundtrack rang out from the woods all around, three loggers sawed strictly according to the musical score, a dialect speaker swore with a vengeance, 17 dulcimer players sat inside the saw-mill as if on a ship. Something like that builds a relationship. Many other types of collaboration followed in the years thereafter. We made diggers dance in a stone quarry, we produced “Music for checking e-mails” or “Sopop”, a real approach to electronic pop music by a trained organist and composer; once we even created the soundtrack to a crime film together (the music was not broadcast as the producer thought it was not ‘emotional’ enough for prime time). We met up for dinner in the Vienna’s central first district on countless occa- sions. In the course of the evening, particularly towards its close, ideas would flow, always on impulse, sometimes without any particular intellectual foun- dations. Out of one of these ideas – the gist of it was: The way we listen has changed, we have to radically trim down classical music! – came the concept of the Beethoven disk. But who had the rights to a good recording of all nine Beethoven symphonies? A new lieder cycle for baritone, prepared piano and electronics – with Georg Nigl and Wolfgang Mitterer himself passionately operating his keys and computer controls. A single (and singular) CD documents the Darmstädter Ferienkurse für Neue Musik 2004: Wolfgang Mitterer’s electrifying pieces for organ and electronics.